Fall is fast approaching and I couldn’t be more excited. It is actually my favorite season. The temperatures are cooling down, fall clothing is my favorite, school is back in season and the cooking and baking is wonderful. Fall is my absolute favorite time to bake and cook. The house is always filled with an array of delicious smells. I love Pralines and Cream! I mean, most people do right?! This yummy dessert is a delicious fall adaption from my Oreo Layered Dessert. I have seen a couple different types of desserts like this out there, like my friend Lynne’s from 365 Days of Baking’s Peanut Butter Dream Bars… YUM! If you love peanut butter- then you have to check out hers! The Sugared Pecans add the most delicious texture to this creamy dessert. It is served cold and the flavors and textures really come together perfectly for each and every bite. The cookie crust is phenomenal. It really adds something special to the dessert. If you are looking for the perfect fall treat that doesn’t require a lot of effort on your part, give this recipe a try! It is sure to be a hit with all who try it! In a 9x13 baking dish combine cookies and melted butter to form crust layer. Press down evenly over bottom of pan and bake for 12 min. Set aside to cool. In a small mixing bowl, beat cream cheese, powdered sugar, and cool whip until smooth and well combined. Set aside in fridge until ready to assemble. In small mixing bowl mix pudding packets and milk and refrigerate until ready to assemble. In a medium size skillet over medium heat, combine pecans and sugar. Stir until sugar is melted. Pour them out onto to a piece of parchment paper to cool. Next gently spoon pudding over the cream cheese mixture. Then top with the cool whip. Sprinkle the cooled sugared pecans over the top. Drizzle caramel sauce over the nuts and refrigerate for at least 2 hours before serving. Nikki this looks insanely good! The layers and layers of flavors! And textures. The Sandies crust, the sugared pecans, the creamy filling...I would need to donate this right after I made it or I'd eat most of it :) Pinned! Been looking for an easy no fuss dessert to take to work. This sounds ideal! Oh my! I am so excited to try this it looks amazing! This is similar to a dessert my Grandma made. 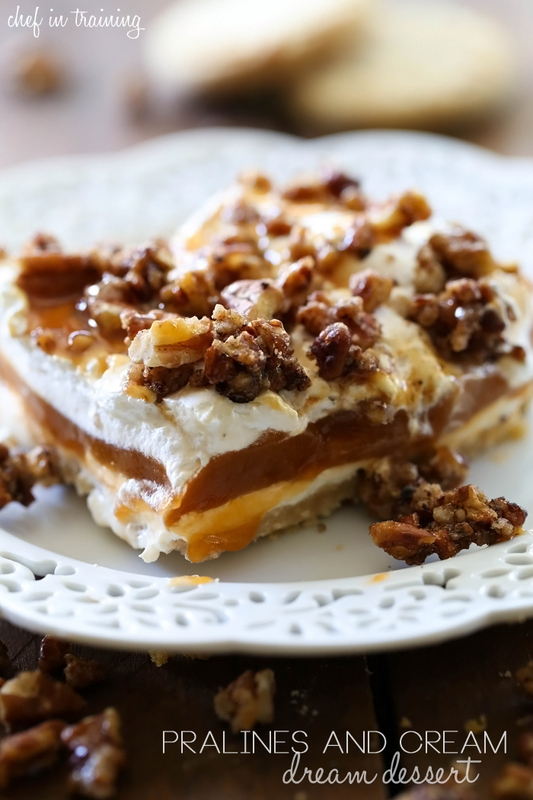 Using the pecan sandies in the crust and adding the sugared pecans on top would surely kick it up a notch!! Thanks! as a Canadian, I've never heard (or seen in stores) of Sandie's cookies - could you suggest a substitute? Thanks in advance! Sandies are just a pecan shortbread cookie. You can use flour....a bit of raw sugar....butter.....and pecans . Mix , and pat into 9x13. I wouldn't use the pecan sandies myself. You lost me at cool whip. Would regular whipped cream work too? I tried this recipe back in September when it was published... it was amazing and a huge hit with my family. So a hit, in fact, it's our official "Thanksgiving dessert" choice this year! Getting ready to make it right now... YUM!! Would love to make these but am not sure if any of these things are available here in UK?